To analyze every instance of “giving a damn” in both Eupho and Hyouka would result in a bloated, awkward essay, especially when there is so much to say about the journeys of the two protagonists. Therefore, this article will argue for the similarities in Kumiko’s and Oreki’s journeys toward “giving a damn”. Building on this, part 2 will survey the rest of the cast to arrive at a conclusion regarding the two shows’ attitudes toward it. Kumiko  begins the series unwilling–even afraid–to emotionally commit. The first sequence of Eupho shows her middle school band failing to progress in a competition, to which Kumiko denies wanting to progress in the first place. In high school, she decides to to learn a new instrument, conveniently giving herself an excuse if she cannot play well. And when the band votes on its ambitions, Kumiko is unable to choose a side. Yet by the end of season 1, she has publicly taken an unpopular position during the audition drama, cried at being cut from a passage she worked hard to master, and realized that “wishes don’t come true unless you give them voice“. Indeed, season 1 of Eupho is Kumiko’s journey toward “giving a damn”. We offer two courses. Which would you prefer? 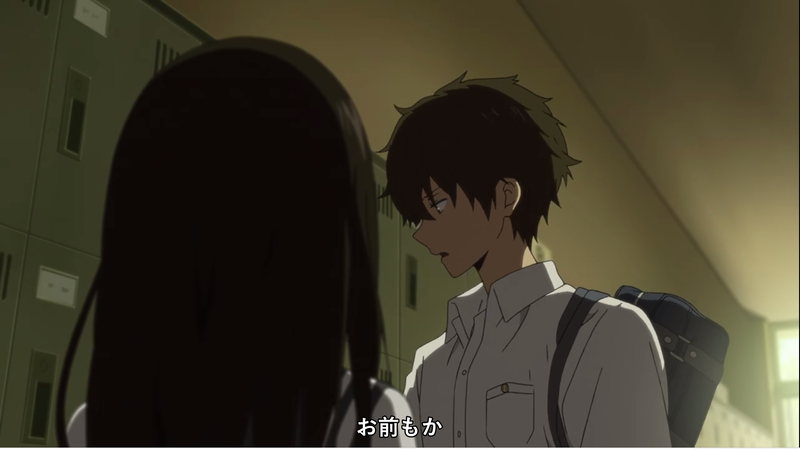 Oreki experiences a similar journey in Hyouka. To highlight his initial emotional detachment, the series begins by introducing two recurring ideas. The first idea is Oreki’s mantra “if I don’t have to do it, I won’t; if I have to do it, I’ll get it over with quickly”, which leaves no room for doing anything out of one’s own volition. The second is the idea of the “rose-colored life”, which he wants no part of. 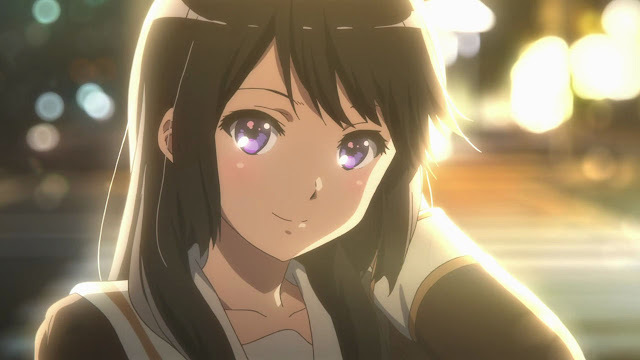 We are given two clues on what Oreki considers the “rose-colored life”. Firstly, when his current “grey life” and the “rose-colored life” are metaphorically laid out in front of him, we see the former containing words like “running away” and “maintaining the status quo”, whereas the latter has words like “nuisance”, “hard work”, and “interest, passion”. 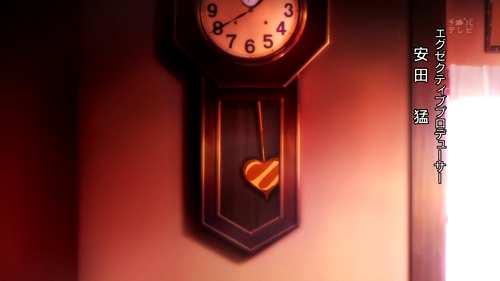 Secondly, the “rose-colored life” comes up twice in the first episode in the context of after-school clubs, which are central to participating in the school community. In this sense, Oreki is avoiding the “rose-colored life” that represents emotional involvement. 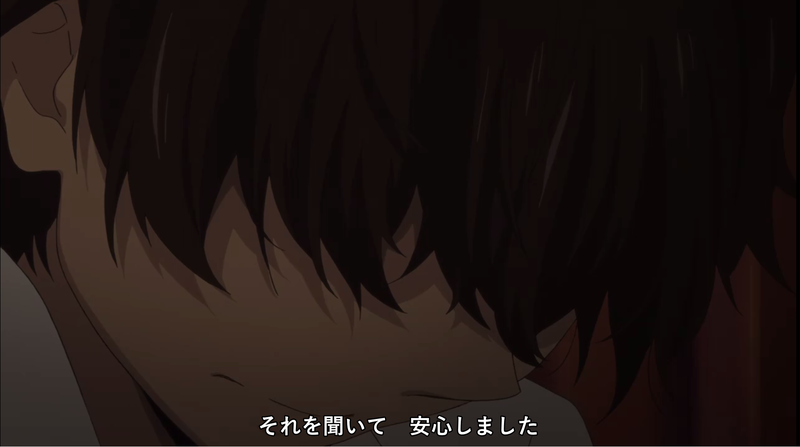 According to Oreki’s monologue, he doesn’t consider engagement inferior: he just doesn’t want to deviate from his mantra. Why? The answer may lie in his conversation with Satoshi at the end of the first episode. Satoshi asks why Oreki doesn’t simply refuse to humor Chitanda’s curious impulses, and posits that this is because Oreki wants to “maintain the status quo”: neither embracing a change in his life nor closing the door on that possibility. It’s an ambivalence that may be explained by a fear of change, where through inaction he hopes to avoid the responsibility of the consequences of either choice. Putting this all together, we can see that Oreki at the beginning of Hyouka refuses to invest his time or emotional energy into anything. Yet, by the end of the series, he has voluntarily helped his club in the cultural festival, gone of his own accord to investigate a mystery, and even gotten angry at Satoshi for an incident only because Chitanda got involved in it. Like Kumiko, Oreki spends the series learning to “give a damn”. People don’t change of their own accord, so what pushes Kumiko and Oreki to change? For Kumiko, the first push is likely from Reina. She spends the first few episodes drawn to the latter: it’s hard to say whether Kumiko feels guilt from middle school, and thereby awkwardly wants to apologize, or whether she is infected by Reina’s passion for her activity, such as being drawn to Reina’s From the New World solo. Or, perhaps, it’s a combination of both. Either way, Eupho leaves no doubt of Reina’s influence on Kumiko. After the two strike up a fast friendship in the breathtaking mountain-top hike, the concrete results of Reina’s inspiration quickly appear. With Reina’s support, Kumiko overcomes her insecurities to perform well at the audition. She then musters the courage to take the unpopular position, publicly siding with Reina in the re-audition. 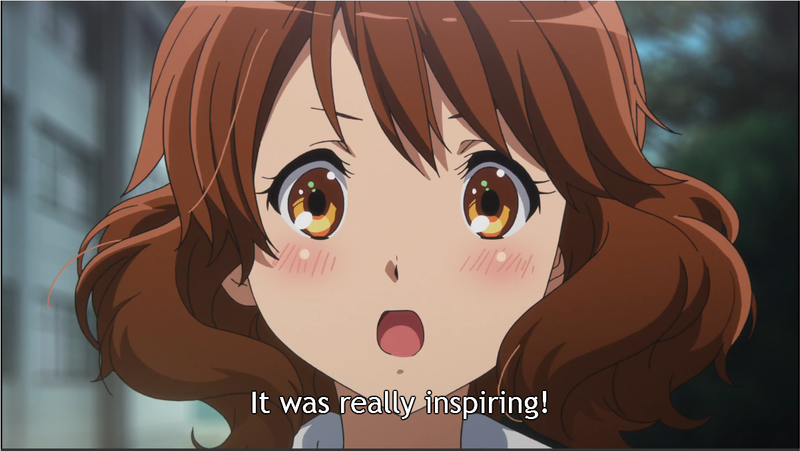 By episode 12, Kumiko has decided to devote her energy to band, to be “special” on her instrument like Reina. Although Reina provides the push, Kumiko’s surroundings play an important role as well. Seeing Natsuki and Shuuichi practice makes her realize how seriously the band is taking the competition. Being around Midori, who is forthright and earnest towards love and music, may also be an influence. 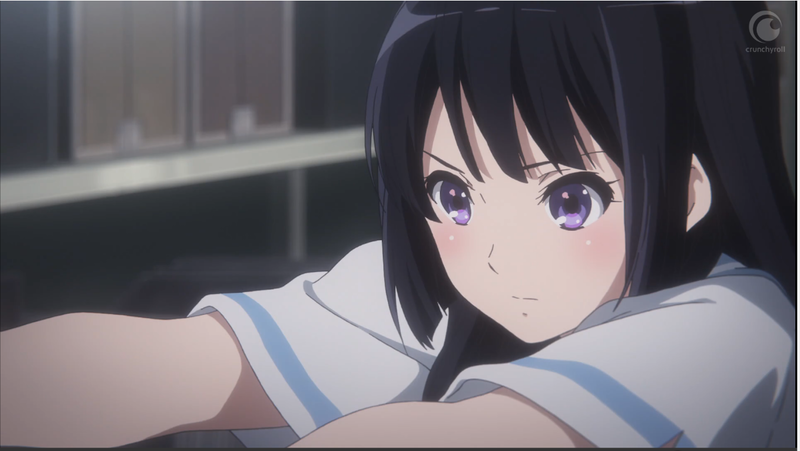 In particular, Natsuki acts as a supportive senior, reassuring Kumiko that she made the audition through her experience and effort, and this allows Kumiko to continue developing a passion for her instrument. For any change to happen, social support is crucial. For Oreki, the push probably comes from Chitanda. 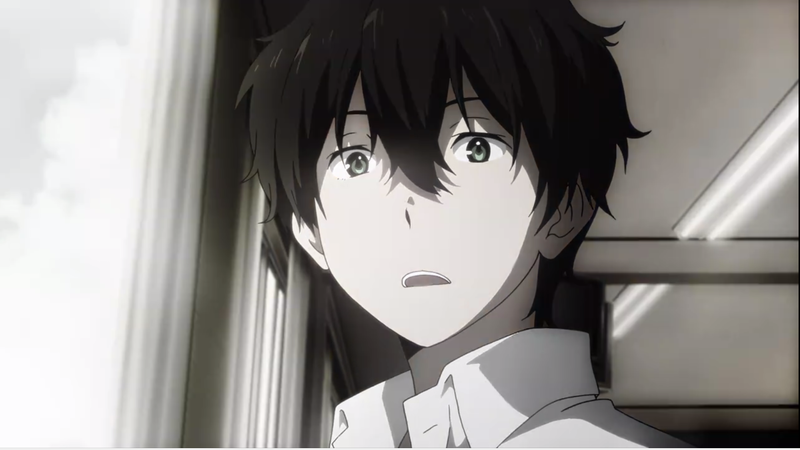 To Oreki, Chitanda’s curiosity and attention to others’ emotions represent a level of engagement that is foreign to him. Yet, he is nevertheless drawn to her, whether because he is smitten or otherwise. Like in Eupho, the visual framing in Hyouka makes clear her influence on him. Unlike Kumiko, Oreki is a more pensive individual, and therefore questions the consequences of the change. Upon conjecturing that Sekitani Jun was expelled for leading a protest movement, Oreki immediately associates it with a rose-colored life–after all, activism takes conviction–and cautions himself against following in Sekitani’s footsteps. Even learning the truth does little to convince him: an episode later, he still remarks that Chitanda lives in a different world, a rose-colored world, that he cannot comprehend. For now, Chitanda’s influence has not gotten him to change. The first time we do see Oreki “give a damn”, sadly, is under Irisu’s manipulation. With a skillful combination of praise for his specialness, expectations of his talent, and guilt-tripping that he should not squander it, she cajoles him into finishing her class’s mystery film. And Oreki devotes his inflated ego into the results. When Mayaka points out the flaw in his reasoning, his world literally turns grey at the shock, and we see him giving excuses, trying to defend his position and ego. He does the same with Satoshi, and by the time he faces Chitanda, he is completely defeated . His meeting with Irisu to find out the truth is but a formality. He feels used, lashes out in fury, and concludes the encounter with a line that appears to close off his foray into “giving a damn” . Oreki has just experienced he drawbacks of emotional investment: by caring about something, he risks being wrong, disillusioned, even betrayed. Kumiko also learns the pains of “giving a damn”. Finally telling Reina she “wants to be special”–which to them means excelling at their instrument, she devotes blood and sweat into perfecting a passage in the concert piece. Yet, reality is sometimes cruel, as her labor is not enough and the conductor asks the other euphonist to play that part alone. Kumiko has worked so hard, only to come up short. What follows is a breathtaking sequence highlighting the pure frustration as she too realizes the risks of emotional investment . The more one is attached to an endeavor, the worse failure and disappointment will feel. Change is not easy, and relapse is common. The important test is for the protagonists to bounce back after their setbacks. For Kumiko, this comes in the form of a timely boost of confidence from the conductor, Taki. She is fortunate to have an instructor who genuinely cares about his students, but she has also earned his respect by impressing him with her passion for her instrument and her resolve to improve. Thanks to this boost of confidence, she continues to engage in the band. By the second season, she has grown to care enough to involve herself in the other band members’ issues, even going as far as opening herself up emotionally in an attempt to break down Asuka’s facade . Oreki is harder to explain. In the next episode, we already see him caring enough about his friends to offer Mayaka a small consolation, knowing that the latter’s mistake weighs on her mind. Soon after, we see him caring enough about the club to actively brainstorm solutions to their current problem (contrast this to episode 4 when he doesn’t do the work that his group assigned him, and comes up with a solution on the spot only after realizing how important the task is to Chitanda). Obviously, the bounce-back must have happened between the two episodes. The answer may lie in the OVA, where, as the critic Creamer argues, Oreki’s friends gather together to cheer him up. Each in their own way, they tell Oreki that he can count on them for help, that they value his companionship. Mayaka tells him she prefers his old antagonistic self, Satoshi is satisfied to see he can be prodded into an emotional response, and Chitanda outright shows appreciation for his abilities. Even if there are risks to emotional attachment, good social support can help weather them. Hyouka and Eupho share similar messages regarding emotional investment, at least in the portrayal of their protagonists. Both start the series unwilling to truly care about their activities, but being drawn to more passionate people, they consider changing as well. This is not a smooth road, as being attached to your endeavors can hurt when some of them inevitably fail. Yet, with timely intervention and a good group of friends, the protagonists can get back on their feet to keep “giving a damn”. But what are the benefits? We will try to see in the next article. Most of my analysis of Kumiko is heavily influenced by the insightful essays over at the MinuteArt blog, specifically the Kumiko analysis and the episode 12 analysis. I do recommend checking out their entire list of Eupho articles though. Episode 12 analysis on the Falling Through the Bed blog. Praise of the voice acting on the Thousand-word Equivalence blog. Episode 12 analysis at the MinuteArt blog as mentioned above. For another perspective of Kumiko’s growth through the two seasons, refer to Kevin’s video on the subject. You’re funny, giving loose translations in French. That made me laugh a lot (hope that doesn’t offend you, though!). In any case, this was a lovable piece, Ink. I really need to rewatch both Hyouka and Eupho S1. Looking forward to the second part. Oooh, that’s really embarassing jaja 😳. I’m glad you enjoyed writing this and thanks for the heads up. The comparison between Oreki and Kumiko’s forays into engagement with the world is a good one. I loved both series’ a lot because I love seeing characters find direction in their lives through attempts at interacting with the world, or well “giving a damn”. 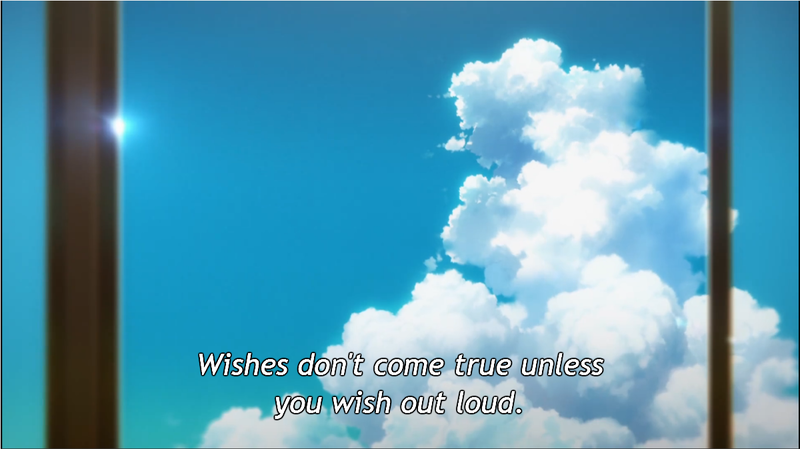 It’s something that resonated with me a lot when I first watched Hyouka in high school and seeing this idea presented with Eupho’s portrayal was really cool. I liked how you touched on just how rocky their paths were in finding their passions and reasons to engage – these kind of things make the characters so much more empathetic and the story, that much more engaging. Good work and I’m looking forward to the second part! Thanks! As I said, originally I wasn’t sure why I liked Hyouka, but thinking of it this way made it make sense to me and matter. Ooh please do. The sixth volume /is/ a short story collection so I would normally recommend it right away, but a couple of the stories occur after the fifth. Let me know what you think of it whenever you get to it!